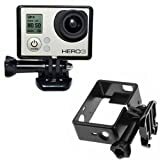 Protective frame for Gopro Hero 3 only. With a mount base and long screw for easy installation. Light weight, durable in use.